Obscure indicators are warning investors of bad times ahead. These indicators are useful. But it’s difficult to find the data to follow them. I’m looking at market breadth indicators. Breadth indicators count how many stocks are moving up or down. That’s important information. A bull market can only continue when most stocks are moving up. When too many stocks are declining, the bull market ends. The chart below shows breadth just broke down. The S&P 500 Index is likely to follow. 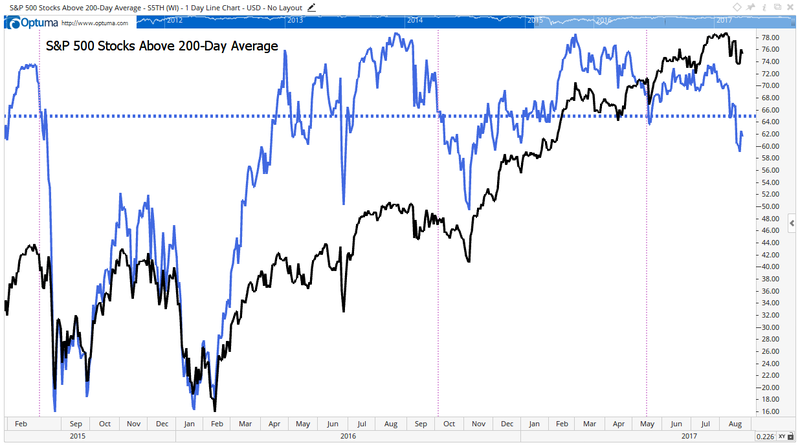 The black line is the S&P 500. It’s been moving higher since May. But breadth has not been following prices. Breadth is the solid blue line. This is the percentage of individual stocks in the S&P 500 trading above their 200-day moving average. In the past, we usually saw the S&P 500 decline when this indicator fell below 65%. That important level is the dashed blue line. Breadth broke below 65% last Thursday. The chart shows the last three times this happened with the vertical dashed lines. Breadth’s breakdown in 2015 came as the S&P 500 fell more than 15%. A 5% pullback followed the signal last September. The most recent signal came as the S&P 500 fell 2%. Not all signals will mark big declines. But all big declines come after this signal. Now is not the time to make long-term investments in the stock market. Short-term strategies focused on managing risk will avoid the large losses of a bear market. And, right now, a pullback over the next few weeks is a certainty. A pullback is a 5% to 10% decline in the S&P 500. It also looks like a bear market is possible. A bear market is a decline of 20% or more. We will know if that’s likely when we see how traders react to the initial wave of selling. If breadth continues to weaken during the pullback, it will be a sign to move to cash.